How Can I Backup a MySQL Database Through cPanel? Yes, you can backup a mySQL database through a user&apos;s cPanel under the mySQL section. Once you load the mySQL section you will launch the phpMyAdmin for that user. Within the phpMyAdmin there will be a link called "Export". Click that and select the database you wish to export and check the box called "Save as File" and enter in a file name in the text field below. 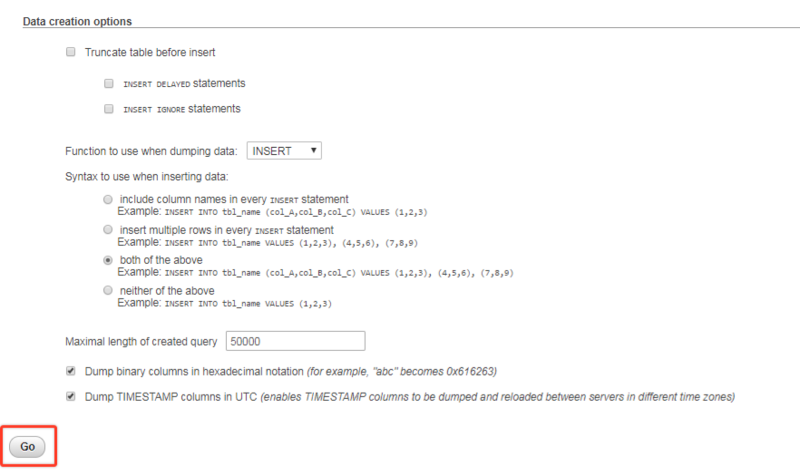 Leaving the default options checked should be good enough for a standard SQL backup. Then hit Go. You will then be prompted by your web browser to save a file to your local computer. This is your newly created SQL backup file. If phpMyAdmin fails to produce a file for download and seems to have be hanging it most likely means that the database you are trying to export is too big for phpMyAdmin.